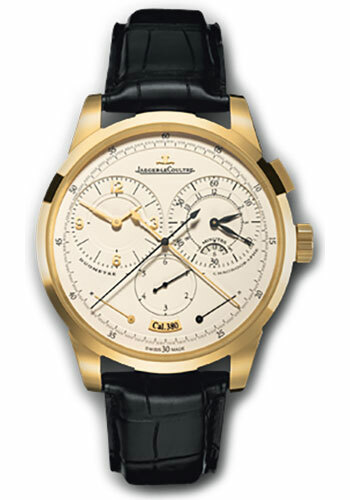 18K yellow gold case, beige dial, hand-winding calibre 380 movement with power-reserve, seconds, chronograph, minute-unit indicator, jumping seconds, chronograph power-reserve, approximately 50 hours of power reserve, alligator leather strap with double folding buckle. Water resistant to 50 meters. 18K pink gold case, silvered dial, hand-winding calibre 380 movement with power-reserve, seconds, chronograph, minute-unit indicator, jumping seconds, chronograph power-reserve, approximately 50 hours of power reserve, alligator leather strap with double folding buckle. Water resistant to 50 meters. 42 mm pink gold case, 13.6 mm thick, transparent back, silvered dial with appliqued numerals, caliber380A manual movement with hour counter, Chronograph, 60-minute counter, 60 second counter, hour - minute, seconds, jumping seconds, twin power reserve, approximately 50 hours of power reserve, brown leather strap, deployant buckle. Water resistant to 5 bar. 42mm by 13.6mm thick 18K pink gold case, silvered dial, calibre 380A manual movement with hour, minute, seconds, chronograph, hour counter, 60 minute counter, 60 second counter, power reserve and jumping seconds, approximately 50 hours of power reserve, brown alligator strap, pin buckle. Water resistant to 5 bar. 42 mm 18K white gold case, 13.6 mm thick, white gold bezel, black dial with appliqued numerals, caliber 380 hand-winding movement with hour - minute, seconds, twin power-reserve, chronograph, hour counter, 30-minute counter, 60-second counter, minute-unit indicator, and jumping seconds, approximately 50 hours of power reserve, black alligator leather strap, double folding buckle. Water resistant to 5 bar. Platinum case, platinum dial, hand-winding calibre 380 movement with power-reserve, seconds, chronograph, minute-unit indicator, jumping seconds, chronograph power-reserve, approximately 50 hours of power reserve, alligator leather strap with double folding buckle. Water resistant to 50 meters.